This is the first CD in the new 'Introducing' series from World Music Network - the fine people who produce the excellent Rough Guide to ... series. And let me say straight away that if the rest of 'em are half as good as this is, we're in for a treat! Furthermore, upon reading the booklet notes I discovered that it was produced by the always excellent Ben Mandelson - who, you may remember, gave us the superb 'Uyghur Musicians from Xinjiang': Music from the oasis towns of central Asia (also reviewed in these pages), among other gems - so it's hardly surprising that it's a great record. Another good reason for me, personally, to like it is that it takes me back a couple of decades to the time when those landmark LPs, Zulu Jive, The Indestructible Beat of Soweto and Thunder Before Dawn first appeared in UK record shops. This was also the time when Edward II and the Red Hot Polkas were investigating African (as well as Caribbean) music, and Johnny Gill, Dave Haines and I were delightedly swapping cassettes of similar material acquired from all kinds of obscure sources. However, much (though by no means all) of that music fell into the Mbaqanga genre - township jive, played by groups. This had developed when the traditional musics of the Zulu and Sotho collided with Afro-American R&B, jazz and blues in the townships servicing the gold mines and industrial heartlands of the Witwatersrand after WW2 to produce, initally, 'townsip jazz', Kwela and Marabi, which in turn coalesced into Mbaqanga - a powerful urban pop. Shiyani Ngcobo does not play mbaqanga - he plays Maskanda; a music born out of the Zulu experience of labour migrancy at the turn of the 20th century. As a musical form, it is recognized by the instrumental flourish that sets the tone at the beginning of each song, by the 'picking style' of guitar playing, and by the rapidly spoken sections of Zulu praise poetry (izibongo). But maskanda is more than a set of formal procedures; it is cherished as a practice that is firmly rooted in Zulu experience. From its very beginnings, maskanda has been self-consciously stamped with tones and textures that are strongly reminiscent of older, pre-colonial musical practices. In the early decades of the twentieth century, migrant workers recalled the comfort of their rural homes by using the sounds and styles they associated with the life they had left behind, while singing of their new experiences in the city. Shiyani Ngcobo was born in 1953 in Umzinto, on KwaZulu-Natal's south coast. The exodus of people into the migrant labour force had already significantly eroded community life at Umzinto, and he remembers his childhood as being a harsh struggle with poverty and the insecurity of family and neighbours always 'on the move'. He has been a maskanda musician for more than thirty years, is a dedicated teacher, and has earned a reputation within South Africa as something of a maskanda guru. The music is categorized into different styles, differentiated according to the rhythms of different dance patterns. Each set of dance patterns is associated with a particular regional community and named accordingly. Ordinarily, maskanda musicians prefer to play exclusively in one style in order to demonstrate their loyalty to the community into which they were born. 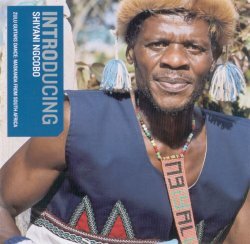 However, Shiyani Ngcobo's music is a mixture of the rhythmic patterns associated with the different maskanda styles, and it is in this regard that his music differs quite significantly from that which has been promoted commercially in South Africa. Maskanda is traditionally a solo occupation, a one-person multi-voiced skill, which you can hear on several of Shiyani's tracks here. But over the years - driven mainly by the commercial needs of the record industry, and the competitive push to hold its own against other local styles - maskanda has moved from being the music of a kind of dynamic acoustic wandering lone-wolf troubadour to that of a larger ensemble, streamlined and formula-ed by the big studios and a local/pop aesthetic. Drums and rhythm groove programming, electric guitars and bass and more. Nothing wrong with that, if in the right hands, only that it reduces the opportunities for a performer such as Shiyani to find a way forward in this milieu. The irony rings out (as has been noted by several maskanda scholars): at base, maskanda is a solo performance that can only be marketed on record as a group sound! So where does that leave us with Shiyani? He has been working in a duet or trio for ages, but also plays solo, both on guitar and on igogogo - a folk guitar made from a 5-litre oli can, wood, wire, nails - which he still prefers for some songs. (sound clip, left - Sevelina) In the end, he's gone for a satisfying mix on this CD: of the 14 tracks, 6 are solo songs (though the other musicians often add their voices to his); one guitar instrumental (sound clip, right - Kheta Eyakho); and the remaining 7 are group performances - though it's rare for there to be more than three instruments playing at once. The performers are: Shiyani Ngcobo - voice, acoustic guitar, igogogo; Aaron Meyiwa - electric bass, voice, foot rattle; Phathekile Lukhozi - whistle, voice; Thulasizwe Ndlangisa - fiddle, claps; Msawakhe Mkhize - concertina. All contribute brilliantly, yet manage never to get in each other's way! It would be impossible to include enough sound clips to give an accurate idea of the breadth of musical experience on offer here, but three more will help a little. Yekanini is the first track (sound clip, left), Arkwehlanga Lungehlanga (sound clip, centre) features the concertina, while another section of Yekanini features the fiddle, some group harmony singing and a little bit of izibongo Zulu praise poetry (sound clip, right). I'd like to make a plea for a new concept - elastic precision. It's what Shiyani has, and what so many musicians have: an absolutely determined (in both senses of the word) and precise groove, with infinite, fractal variants that relate to what comes before and after ... Perfection may be infinitely seductive, but it's the flaws and differences that make the beauty.